Not surprisingly, crashes that happen on higher-speed roads are more likely to result in fatalities. While two-thirds of bicycle crash injuries occurred on city streets (likely because bicyclists spend the most time riding on city streets versus other roadway types), the largest percentage of bicycle crash fatalities (33%) occurred on U.S. and state highways (which represent only 15% of injuries). 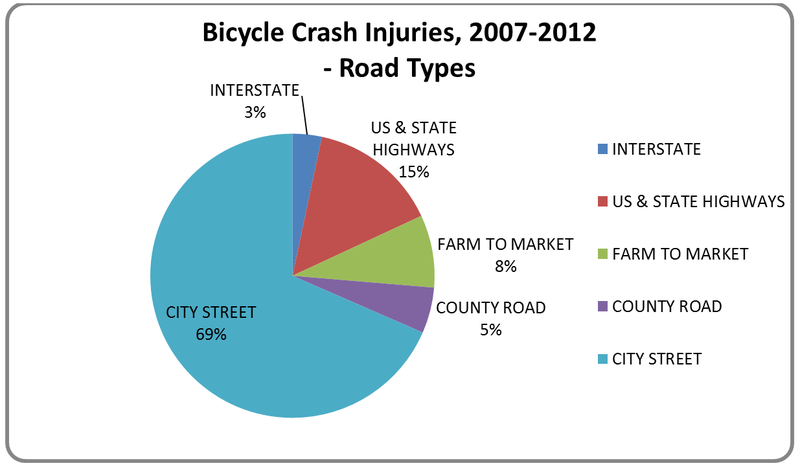 Interstate highways and farm-to-market roads similarly account for larger percentages of bicyclist fatalities compared to injuries. Safety outreach in a state as big as Texas can be daunting — where does one start to get the safety message out. Bicycle crash data shows us the top counties in need of education: Harris, Travis, Dallas, Bexar and Tarrant counties top the list for bicycle crashes in the state. By focusing outreach and safety awareness efforts in the high risk counties, in addition to current efforts in other areas, we can all make an impact in our state and improve safety for cyclists and motorists alike. 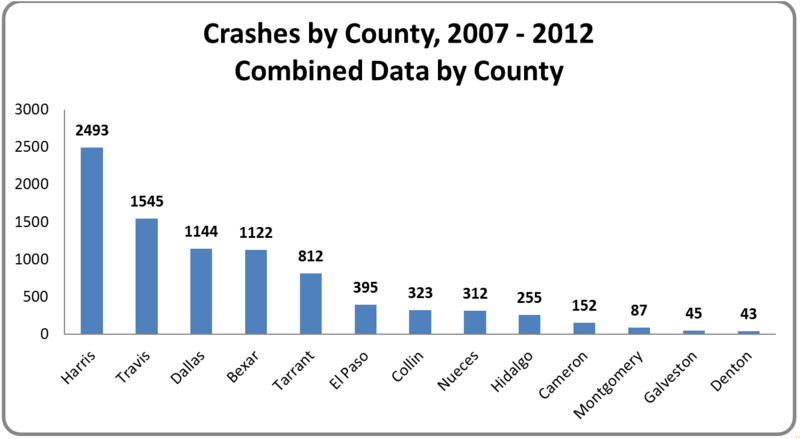 From 2007 to 2012, there have been 12,789 crashes in Texas involving bicycles, resulting in 12,132 injuries and 297 fatalities. Over one-quarter (27%) of cyclists involved in crashes are younger than 15; another 25% are between 15 and 24. Males represented 81% of bicycle crash victims (2007-2012).